Do you want to turn your ordinary meals at home into something extra special? Then, you should own a turkey fryer pot, specifically a stainless-steel or aluminum-made stockpot. With our list, you can definitely own a stainless-steel or aluminum-made stockpot today! All of the pieces we have here are priced affordably. And for such a reasonable price, each of the products promises a lifetime of service for you and your whole family. Get yourself a glass of wine, and get that turkey frying! Stainless steel pots are extremely durable and will last for decades. This is what you’ll see in professional and commercial kitchens. Stainless steel pots are easier to clean, and they can also stand up to some serious beatings. Your usual Sunday family meals may have been meant for grilled and simple fried dishes. Now, you can turn them into extraordinary weekend meals as if every Sunday is a Thanksgiving celebration. Serve fried turkey or other meats on the table with special sauces using any of the pots we have here. Read on and see what suits your family meal needs. The good news is that, whatever your choice is, you can certainly own it in just one click! Keep on reading for the best options for a fry pot. You’re sure to find the one that suits your tastes and budget. The Bayou Classic Stainless-Steel Stockpot is your answer to party-hosting dilemmas. That’s why we placed it on the No. 1 spot. It surely takes a lot of work to prepare for a party. The dishes to serve are on top of your to-do list, followed by the invitations send, tables and chair to rent, and arrangements of the house, among others. This cooking equipment can cook practically anything and everything that’s listed in your menu. And because it is a 62-quart stockpot, you can even cook big measurements of ingredients whether you’re steaming or boiling them. Stainless steel pots are also very easy to clean, even after frying with a little bit of soap and hot water. It’s much easier than some of the cheaper aluminum pots where the oil seems to stick to them, no matter what you do. This product is so affordable on Amazon, especially considering that it’s a stainless steel pot. Isn’t it so reasonable for the price that you one can already own a cookware piece you can depend on whatever event you are hosting at home? This multi-functional cooker has a high rating on the popular site mentioned. Designed for outdoor cooking, this stockpot guarantees safety, not just for you as the cook, but for your whole family, too. It is also famously known for its flexibility as it can cook any kind of soup, braise, jambalaya or broth. See: Full Review of the Bayou Classic Stainless-Steel Stockpot. Vented lid, with heavy duty welded handles on the pot. It’s virtually indestructible! 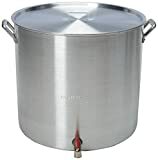 We consider the Concord Triply Bottom Stock Pot our 2nd highly recommended turkey frying pot because it is one of the most affordable stockpots offered on Amazon today. At a very reasonable price, you are already treated to this product’s many different functions. The pot may have been made mainly for deep-frying and boiling purposes. However, it can also do many other things like steaming and boiling vegetables. Indeed, you can already do all of these in just one cooking. There’s no more need for you to prepare the side dishes and appetizers in batches- you can do it all at once with this pot. Home brewers love this pot as well. Stock pot is made from Commercial Quality Stainless Steel, Fully Polished. Stainless Steel handles riveted onto pot and Lid for solid construction. 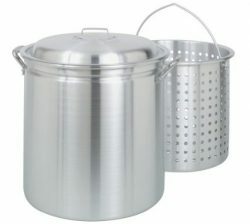 Stock Pot is made from Full Stainless Steel with new Lid design. Very heavy duty construction, will last a lifetime. For a very reasonable price, the Concord Triply Bottom Stock is guaranteed to be very durable. Its maker used high-quality stainless steel for the material to ensure decades of cooking functions. This is a 60-quart cooker so it can accommodate foods in large sizes. This low-priced cooking product’s handles are made tight, thick and sturdy too, for easy handling. More so, the same handles are designed to protect you from any harm. And even though this equipment is quite heavy, it can still be easily transported or moved for your total convenience. 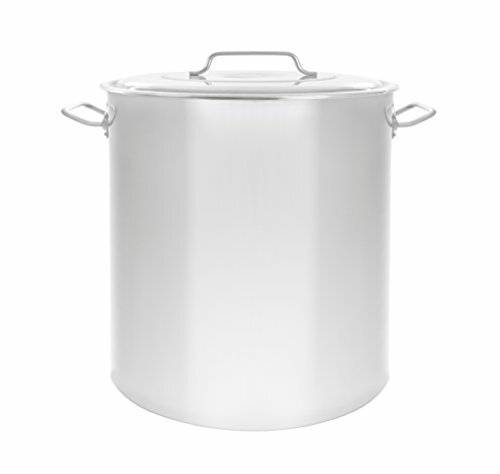 See: Full Review of the Concord Triply Bottom Stock Pot. You can easily buy the Concord Triply Bottom Stock Pot on Amazon today. 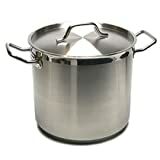 We LOVE Stainless steel stock pots here at Love Deep Fried Turkey. They are extremely durable, and should last you a lifetime of turkey turkey, or home brewing. 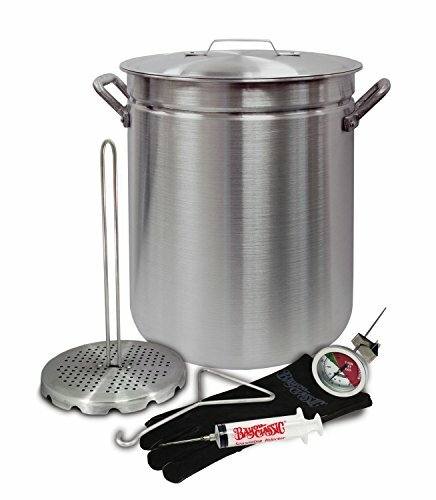 Taking third spot on our list of the Top 5 Turkey Frying Pots is this one from New Professional. At 60 quarts, it’s a nice size that can handle a big turkey, but it’s so big as to be too unwieldy and heavy to pick up when full of liquid. The 3-ply surface is very durable and sturdy. Most people find the New Professional Turkey Frying Pot quick to clean, and the oil kind of just slides away with a bit of dish soap. The size of the New Professional Stock Pot allows it to have many uses. Of course, you can fry a turkey, or brew beer. But, you can also use it for canning jams, pickles or other things. You can cook other foods (outdoors), or make a big batch of soup or stew. For a stainless steel turkey frying pot, it’s very affordable. Sure, it’s a bit more expensive than aluminum stockpots, but it’s so durable and will last you a lifetime. Our 4th and 5th on the list are the aluminum-made ones. If you are looking for a cookware you can trust for all seasons, consider the Bayou Classic All-Purpose Aluminum Stockpot. Even if though it is usually identified with turkey-frying during Thanksgiving, this piece can do more! Bayou classic is a trusted name in Southern cooking, and they have a reputation for excellent customer service. For a long time now, aluminum Bayou Classic stockpot has become a household favorite because of the convenience it provides. It is one of the most popular products in the stockpots category for its ability to contain liquids and other ingredients in large amounts. Undoubtedly, the Bayou Classic All-Purpose Aluminum Stockpot is designed not just for your weekend family get-together but for other special occasions held at your own home, as well. With this cookware, there is no need for you to spend extra to buy the party foods from the restaurant. Don’t you find it worthy to spend for especially that it functions as excellently as the ones used in the famous food chains? This pot is also very popular with people who home-brew beer. If you’re looking for a large, yet affordable pot, consider this one from Bayou Classic. It also comes with a poultry rack which makes for easy deep frying. Or, you can use it for a seafood bowl or fish fry. See: Full Review of the Bayou Classic All-Purpose Aluminum Stockpot. Quick note: Be careful with storage of this one. It can get dings in it if you’re not careful. 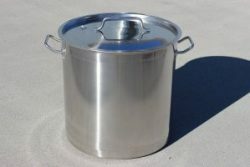 Rounding out our list of the Top 5 Turkey Pots is this aluminum one from Winware. The Winware Professional Aluminum Stockpot is one of the highest-rated stockpots offered on Amazon today. This means you are guaranteed of a high-quality product a s this is considered a bestseller on the said site. Those who are fond of cooking choose this pot as it is perfect especially when preparing for a party. 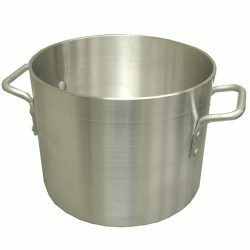 Since this is a 60-quart aluminum pot, you can make soup or pasta sauce in large amount for generous serving. Don’t worry about the number of guests you are expecting. You are sure to feed everybody with the dishes you excellently cooked in this high-quality stockpot. For a very low price, you can already own an aluminum pot made professional cooking. But even though this has the quality of an expert cooker, you don’t have to be in the culinary field to use it. It is effortless handling this Amazon top-rater. See: Full Review of the Winware Professional Aluminum Stockpot. If you’re looking for one of the biggest pots you can buy, you might want to check out the King Kooker 160 Quart Pot. It’s certainly big enough to handle just about anything you’d possibly want to fry, or cook in it. It has a drain valve, perforated fry basket, and a well fitting lid to help prevent splatters and accidents. What about a Cast Iron Pot? A common question that people have is whether or not a cast iron pot will work well for deep frying. If you’re doing small amounts of food on the stove, they actually work quite well. It distributes heat evenly and has a thick enough bottom. A whole chicken or fries, for example can be done in cast iron on the stove in your kitchen. However, for something as large as a a turkey? Not so much. Even if you are able to find a pot big enough, it’ll be way too heavy to rest on most stands without crushing it. Plus, you need to be able to lift the pot as well. A stainless steel or aluminum deep frying pot, when full is heavy enough. What’s the Best Pot for Brewing Beer? All the pots on our list work well for that purpose. You’ll be able to deep fry up a turkey in style for your next Thanksgiving feast. But, what about if you’re looking to buy a pot for brewing beer? In reality, any of the pots on this list will work well for you. In particular, you may want to stick with some of the cheaper aluminum pots because clean-up isn’t really an issue. If you’re deep frying, you may opt for stainless steel because cleaning them is very easy with just some soap and hot water. But, for beer? Nothing sticks to the pot so it’s much easier. Learn How to Deep Fry a Turkey? If you’re looking to buy a turkey pot, you may be just getting started with deep frying turkeys. Check out this video below for some tips and tricks on how to do it easily, and most importantly, safely. What are the Best Turkey Frying Kits? Top 5 Turkey Fryer Pots: Have your Say! What’s your top pick for a turkey fryer pot? Are you going stainless steel or aluminum. Leave a comment below and let us know your thoughts.